Amil’s Inn Bed and Breakfast has been blessed the past 2 years to have guests that were participants in the Rails to Trails Marathon which takes place each fall in Norwalk, Wisconsin which also includes a Half Marathon, 5K Run/Walk and 1 Mile Run/Walk. 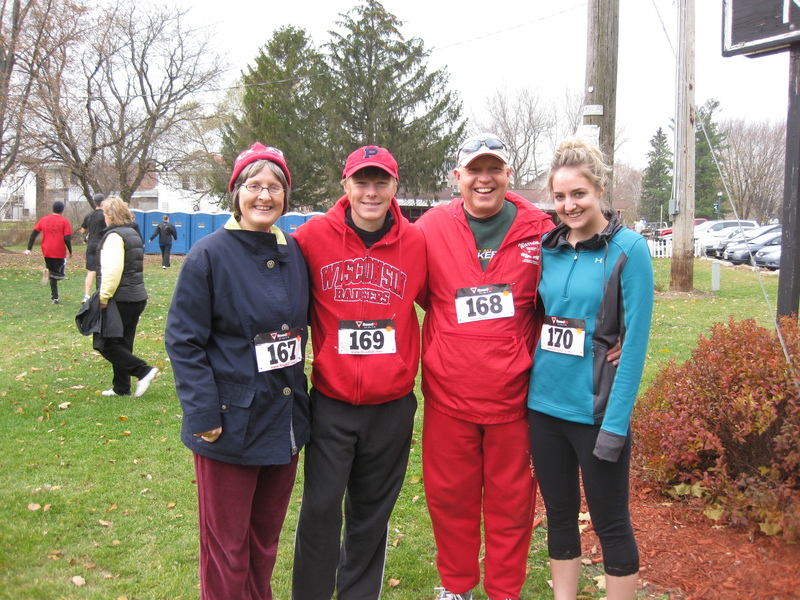 These guests were so positive and encouraging that your innkeepers were finishers in last year’s Rails to Trails 5K!! The encouragement had a residual effect which resulted in your innkeepers to be participants in the 3rd Annual Reedsburg Medical Center Vet Fest. 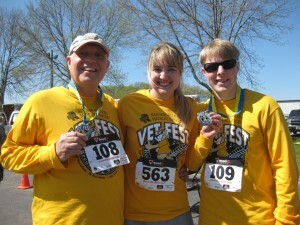 Dave and Paul were finishers in the Half Marathon and Rachel was a finisher in the 5K. The 3rd Annual Reedsburg Medical Center Vet Fest took place on Saturday, April 14, 2012 at Reedsburg’s Nishan Park. The Reedsburg Medical Center Vest Fest consists of a Half Marathon, 5K Run/Walk and 1 mile Walk which unfolds along a hilly and challenging course throughout Reedsburg and surrounding area. The out-and-back loop course for the Half Marathon begins and ends in Reedsburg’s Nishan Park, a recreational park with baseball fields for Little Leaguers of all ages on Reedsburg’s Viking Drive, near the Reedsburg Jaycees building. From there, runners follow the route in and around the town and through the rolling country roads of Sauk County and then make their way back to Nishan Park, past the home of the Veterans Memorial. In 2011, just over 330 runners crossed the finish line in the Half Marathon (143) and 5K (195). The 2012 race consisted of 166 Half Marathon runners—89 female/77 male and 266 5K runners—177 female/89 male. Results taken from www.onlineraceresults.com. The Vet Fest began as a benefit for the Reedsburg Area Veterans Memorial. 100% of the 2010 and 2011 registration fees supported the completion of the Memorial. Over $30,000.00 was donated. Proceeds from the 2012 annual race will go to the Reedsburg Area United Fund and the Reedsburg VFW Post 1916. The preliminary numbers indicated that over $12,000.00 will be donated. To learn more about the Reedsburg Veterans Memorial visit www.reedsburgvfw.com/memorial.php. Amil’s Inn would love to have any 4th Annual Reedsburg Medical Center Vet Fest participants as guests. Mark your calendars for the 2013 Vet Fest Race which will be April 13, 2013. A special race day breakfast is served to all participants!!!!! Your Innkeepers--Anita, Paul, David, and Rachel--5K Finishers!!!!!! It’s not too late to start planning for the 5th Annual Rails to Trails Marathon which takes place each fall in Norwalk, Wisconsin. The 4th Annual Rails to Trails Marathon took place on Sunday, November 6, 2011. The day was a bit windy and a cool fall day-a beautiful day for a race. The Rails to Trails Marathon is not only a full marathon (Boston Qualifier) but also a half marathon, 5K and 1 Mile fun run. 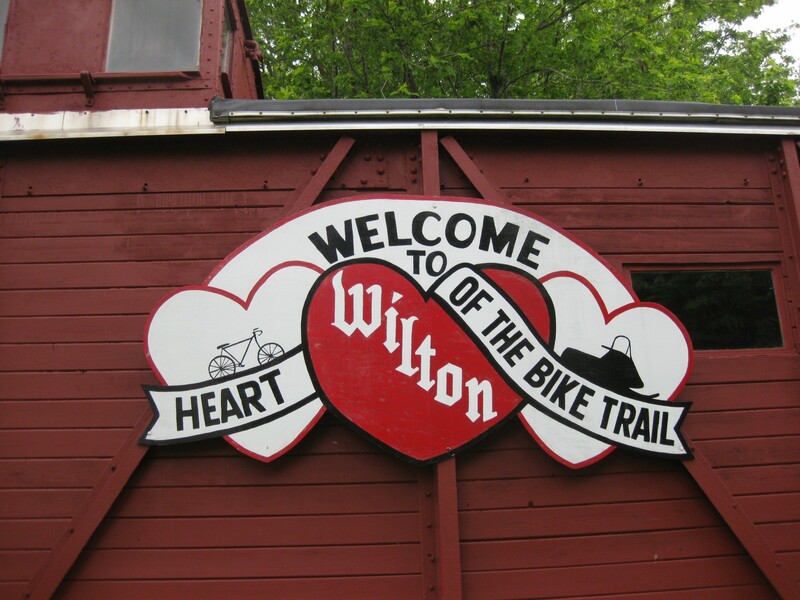 The course takes runners and walkers on tour of the Elroy-Sparta State Trail, a former railroad that’s been converted into a 32 mile paved recreational trail that winds through the small towns and countryside areas of southwestern Wisconsin between the towns of Elroy and Sparta. The 4th Annual Rails to Trails Marathon had 230 marathon finishers of which 164 were male and 66 female, 436 half marathon finishers of which 170 were male and 266 female and 124 5K finishers of which 45 were male and 79 were female. (results taken from www.itsracetime.com). 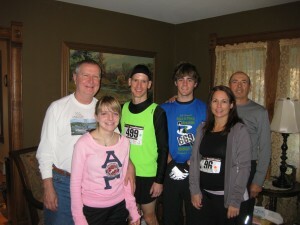 Amil’s Inn Bed and Breakfast was honored to have 3 of the 2011 marathon finishers as guests at our inn for the event. 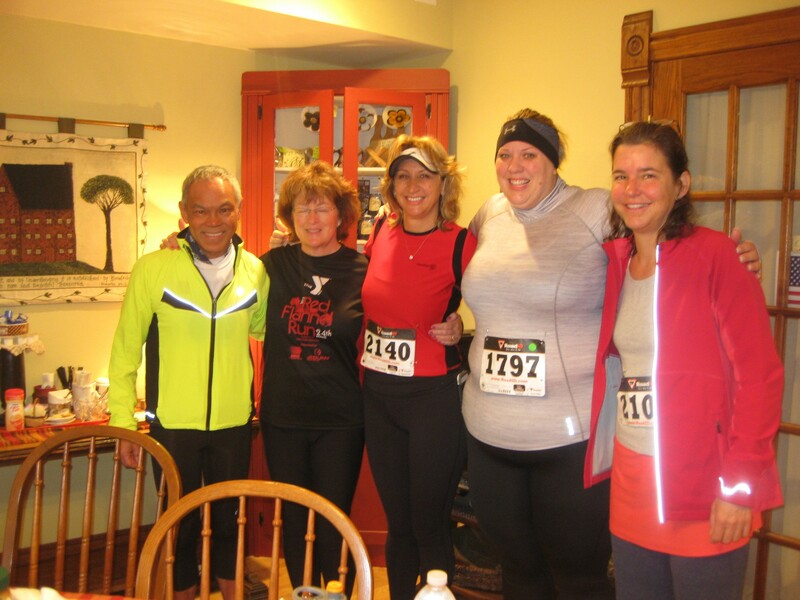 Last year’s marathon guests were so positive and encouraging that 4 of the 2011 5K finishers were your Innkeepers, Anita, David, Rachel, and Paul. Paul finished 28th overall, Rachel 83rd overall, and David and Anita at 104th and 105th overall. More information will be given when it becomes available for the 5th Annual Rails to Trails Marathon. Here are a couple websites to follow for more information as well: www.railstotrailsrace.com and www.elroy-sparta-trail.com. It’s not too late to start planning for the 4th Annual Rails to Trails Marathon which takes place each fall in Norwalk, Wisconsin. 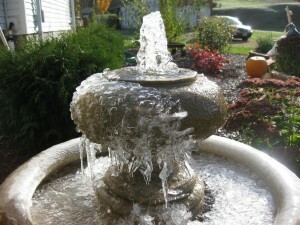 The 3rd Annual Rails to Trails Marathon took place on Sunday, November 7, 2010. The day was a beautiful sunny fall day with fall color still in the trees. The Rails to Trails Marathon is not only a full marathon but also a half marathon, 5K and 1 Mile fun run. The course takes runners and walkers on tour of the Elroy-Sparta State Trail, a former railroad that’s been converted into a 32 mile paved recreational trail that winds through the small towns and countryside areas of southwestern Wisconsin between the towns of Elroy and Sparta. The 3rd Annual Rails to Trails Marathon had 273 marathon participants, 383 half marathon participants and 111 5K participants. Amil’s Inn Bed and Breakfast was honored to have 6 of the participants as guests at our inn for the event. They included a dad and his teenage daughter, a mature grandfather with his daughter and grandson as well as a well maintained, dedicated marathon runner! They were all so positive and encouraging that the innkeepers of Amil’s Inn may join them in the future. More information will be given when it becomes available for the 4th Annual Rails to Trails Marathon. Here are a couple websites to follow for more information as well: www.railstotrailsrace.com and www.elroy-sparta-trail.com. The 3rd Annual Rails to Trails Marathon will take place Sunday, November 7, 2010. Known for its steady and challenging uphill stretches that await runners along the first few miles of the course, the Rails to Trails Marathon, Half Marathon, 5K & 1-Mile Fun Run takes runners and walkers on a tour of the Elroy Sparta State Trail, a former railroad that’s been converted into a 32-mile paved recreational trail that winds through the small towns and countryside areas of southwestern Wisconsin between towns of Elroy and Sparta, and features three long tunnels that hikers, walkers, bikers and runners can pass through — one of which runners will run through during the race. All four races in the event start and finish at the Norwalk Village Park on State Highway 71 in the town of Norwalk. From there, participants follow the course along a northwestern route up and out of the center of town out along the trail, and encounter what are perhaps the course’s most significant hills in the first four miles of the race. From the starting elevation of just over 1,000 feet above sea level, the course reaches nearly 1,400 feet above sea level by the time runners reach the mile 4 marker. There are a few short downhills along the way but otherwise it’s a long, steady uphill stretch from the start to the fourth mile. 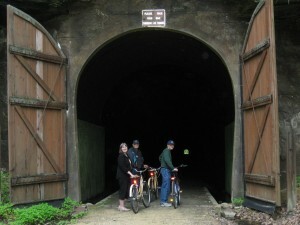 Shortly after crossing the mile 4 marker, runners enter the longest tunnel along the entire Elroy Sparta Trail, which is roughly three quarters of a mile long. As they’re about to enter the tunnel, course volunteers hand every runner a flashlight to carry with them through the tunnel to light their way, which they can drop off on the other end and pick up once again on the return during the second half of the race. Open to both runners and walkers, the half marathon starts at 10:00 AM, and follows an out-and-back route that turns around at about the half-way point of the full marathon course, and then runs back through the tunnel a second time for the finish in Norwalk Village Park. The one-mile “Fun Run” also starts and finishes in Norwalk Village Park, and features an 11:00 AM starting time.